An Actor's Companion: Tools for the Working Actor (Paperback) | The Drama Book Shop, Inc.
An Actor's Companion is ideal for both seasoned professionals and beginning actors. The tips and exercises are simple and direct, and easy to apply in both rehearsal and performance. Seth Barrish is an actor, director and co-founder of The Barrow Group, a theater company and acting school, in New York City. During his near forty-year career he has directed the award-winning My Girlfriend's Boyfriend, Sleepwalk with Me, The Tricky Part, Pentecost, All the Rage and Old Wicked Songs. 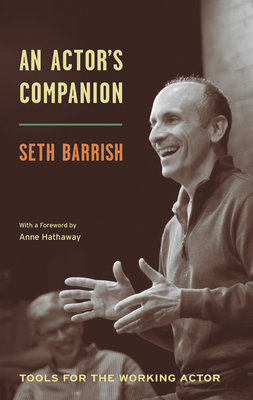 Seth Barrish is Co-Founder and Co-Artistic Director of The Barrow Group, a New York-based theater company and school. As a director, his credits include the award-winning shows All The Rage, My Girlfriend's Boyfriend (final performance at Carnegie Hall), Sleepwalk with Me, The Tricky Part, Pentecost, Old Wicked Songs and Good, as well as dozens of productions Off-Broadway and in theaters across the United States and around the world. He directed the Netflix comedy special Mike Birbiglia: My Girlfriend's Boyfriend, and was co-director for the feature film Sleepwalk with Me. He is a renowned professional acting and directing coach and teacher. As an actor, he appears regularly in film and on television. He is also a composer and songwriter (SESAC). He is most proud of his affiliation with his family: Lee Brock, Phillip and Rachel Barrish.